Abraham – Putting Feet to our Faith. It’s hard to talk religion too long without hearing the name Abraham come into the discussion. Three of the world’s largest religions, Islam, Judaism, and Christianity all trace their faith back to Abraham the patriarch. Why is this ancient father such a powerhouse? It’s not because the guy was perfect. That’s seen in many ways and none the least is the fact that he lied about his wife, not only once, but twice, to save his own skin. The root of this man’s success with God was based in an authentic faith that caused him to get up and trust God in very profound ways. His story picks up in Genesis chapter 12 where God first comes onto the scene of Abe’s life and the patriarch launches out in one small step of faith after the other. If we were to dissect his faith for a moment, what would it look like? In short, it was risky. Abraham had a faith beyond the unknown. God called him out of the land where he had grown up, the place and culture that he knew, to follow him someplace where he had never been before. There was no road map or laid out plan of action. It was just “Come and Follow me and I’ll show you when you’re there.” God sometimes calls us into the unknown as well. We want details and often he gives us none. Abraham had a faith undaunted by the unbelievable. Part of Abraham’s life story was that he was old. His wife was old. In this late state of his life he had no children and the prospect of bearing one was unbelievable considering Sarah’s advanced age. Yet God had the audacity to tell Abraham that if he stepped out in faith, and trusted him, his descendants would be more than the stars in the night’s sky. Sometimes God makes those unbelievable kinds of promises to us as well. They’re just too big to fathom coming to fruition. Abraham had a faith despite the unreasonable. 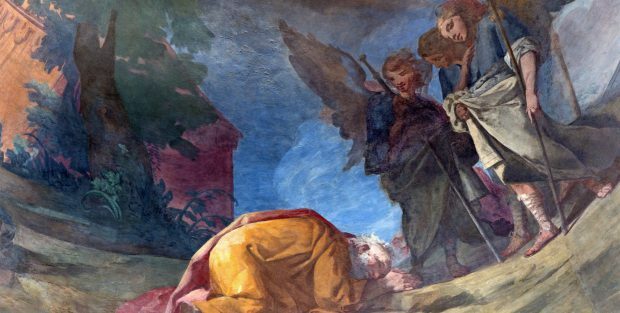 Faith got really tricky after his son, Isaac, was a young man and God then told Abraham to offer him up as a sacrifice. That just doesn’t make sense. It’s not reasonable, not to mention doesn’t seem very loving. But Abraham reasoned that in some way, beyond his understanding, God was able and willing to keep his word. He trusted that God would raise Isaac from the dead or come through in some other miraculous fashion. The text tells us that he stepped out in obedient faith, trusting that God would somehow work things out, and just before Abraham went through the obedient act of sacrifice, the LORD stepped in at the final second to stop the action. There are times when God calls us to trust him as well even when it just doesn’t make sense. It’s unreasonable. So what were the results of his risk? In all of these occasions and more, Abraham trusted God and God came through. It was not always according to Abraham’s schedule, but God kept His word. At the end of the day, God fully kept his promises. Abraham was blessed personally with his son. Through Isaac came Jacob and the 12 tribes of Israel and thus Abraham was blessed nationally. And finally, the international blessing came through the Messiah, Jesus Christ, who was of the line of David of the tribe of Judah. Yes, the world is now blessed through Jesus because Abraham stepped out to trust God. Yes, Abraham blew it from time to time, but the New Testament does not remember him that way. Rather, James refers to Abraham as a friend of God. That is what God is looking for and that is what God is looking for in you. True faith is risky. It will call you to step out of your comfort zone. It may be something large like resigning a high paying job and moving to the mission field or it may be something as simple as sharing your faith story with a co-worker. It may mean taking the step of faith in staffing a Marked Men For Christ weekend or inviting a friend to come along with you as a missioner. It may mean stepping up your tithing at your local church and then risking even more to help fund future P1 weekends for MMFC. Whatever it is, consider both the risks of stepping out of the boat and also what is at risk if you do not. Yes, faith is risky, but sometimes doing nothing is actually more of a risk. On the other hand, no one really knows what God has in store for you when you do step out. So what are you waiting for today?